Strawberries are among the many fruits you don't have to toss just because they're a little ripe. Turning them into popsicles, jam, or bread are just a few ways to enjoy fruit past its prime. One of the best parts of summer is the bounty of fresh fruit it brings. Juicy peaches and cherries, sweet and tart berries, and refreshing melons are all in season. It's easy to get a little carried away while roaming fruit stands. For those of you who enthusiastically haul home more fruit than you can eat by the end of a week, this story is for you. One of the simplest solutions is to chop up your fruit (unless they're berries! ), stick it in a plastic ziplock bag, and throw it into the freezer. When you’re ready for a refreshing treat, blend the fruit chunks into smoothies or just eat them as is. Jams are surprisingly simple to make. Add pieces of fruit to a saucepan with white sugar, a little lemon juice, and spices of your choice, and let cook until the mixture has thickened. Then go ahead and enjoy your once overly-ripe fruit on toast, crackers, and waffles. Sterilize your jam jars by boiling them for 10 minutes in a large pot, or running them through a dishwasher. To sterilize canning rings, place them in a small saucepan, cover with water, and bring to a boil. Turn off heat and add lids to soften their rubber gaskets. Leave in water until jam is ready. Combine 4 cups of mashed strawberries, 1 cup white sugar, and 2 tablespoons of lemon juice into a pot and stir until combined. Bring the mixture to a boil, stirring frequently. Simmer on a low boil for around 15-20 minutes, or until it is a consistency you like. Pour into jam jars one-half inch from the top. Place lids on jars, screw on rings, and then lower the jar into the water and boil for another 10 minutes. Lift out and let cool. Blend your fruit into a puree, pour the mixture into popsicle molds, and stick in the freezer. Check back later in the day, and voila! Delicious, healthy popsicles, ready for backyard picnics or mid-day snacking. Smoothies are a classic way to use up fruit. Combine either frozen or fresh pieces of fruit, a handful of ice, and your choice of milk (check out these awesome non-dairy alternatives). Blend it all together for a breezy, beautiful drink. 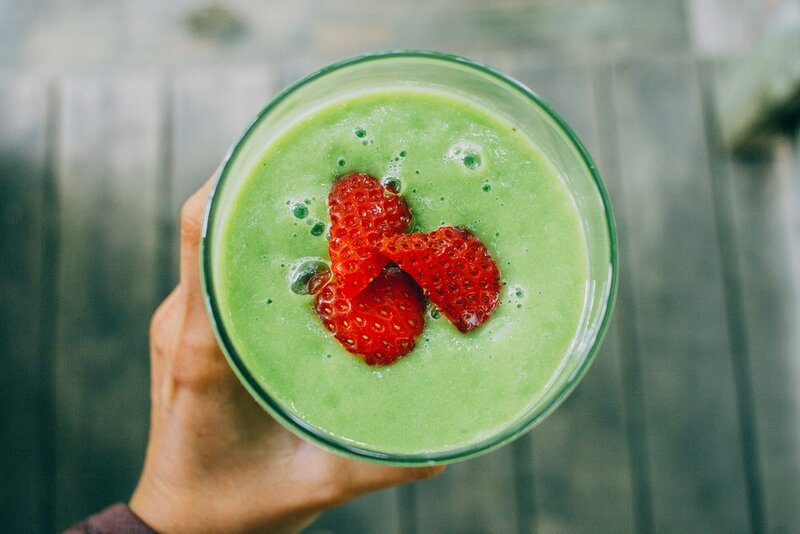 Blend a ripe banana, anywhere from ¼ to ½ cup of a dairy or non-dairy milk, and a big handful of spinach for extra nutritional benefits. Feel free to add other frozen or fresh fruit you have on hand as well. Berries add a tart sweetness to vinaigrettes. Try it drizzled over a savory salad containing salty ingredients, like cheese and roasted nuts. Yum. In a jar, combine mashed raspberries (the more liquid, the better), ¼ cup olive oil, ⅔ cup balsamic vinegar, 1 tablespoon honey, ½ teaspoon of salt, and a touch of freshly ground pepper. Screw on the lid, and shake. Drying fruit is another delicious way to rescue it. Dry apples, peaches, or bananas by slicing them, keeping the thickness uniform. Laying your slices on a baking sheet and bake at 200 degrees for 3 to 5 hours. You can also make fruit leather. Puree fruit and pour it in a thin layer on a tray lined with a silpat or parchment paper. Bake at 150 degrees until the texture is leather-like, or about 6 to 8 hours. If none of the ideas above work for you, add it to a compost pile! For information on composting, check out this informative piece written by regenerative gardening expert Acadia Tucker. And if that doesn't work for you, consider outsourcing your composting demands. Many curbside composting services are springing up in cities and towns across the country. Maybe there's one near you.